09. How Many Of Us? Note : Insight is the Emcee-Producer, while Damu the Fudgemunk is the Producer-DJ. Y Society est un duo composé du "touche à tout bourreau de travail" Insight officiant au micro et du Dj/producteur Damu The Fudgemunk (Panacea). Dans la pure lignée des People Under The Stairs, Y Society délivre une musique à base de samples, dans l'esprit de ce qui se faisait de meilleur au milieu des années 90. Y Society, the duo of Insight and Damu the Fudgemunk, are proud to present to you: Travel At Your Own Pace, their debut album as a collective unit. Travel At Your Own Pace is over one hour of “real raps and hard beats.” Infusing elements of the past with the promising sound of the future the overall message of the album is to simply listen to it, and take from it what you will. Tracks such as “Never Off” and “Puzzles” are easily recognized as trademarks of two passionate hip-hoppers with intuitive rhymes over instrumentals that leave you feigning for more. The seemingly title track “At My Own Pace” sees Insight doing exactly that; rhyming at his own pace (which is “sometimes fast, and sometimes slow”) over Damu’s densely composed beat. Their goal is to make us all consciously aware and proud all over again of hiphop music. Insight has asserted his career over the last decade not only as an MC, but also as a producer and DJ. With an abundance of releases and shows under his belt, Insight is no stranger to the industry. The Boston, MA resident has gained the respect of his peers including Mr. Lif, Edan, and Electric Company. Insight has a consistent ethic of integrity and genuine passion put forth into his music; obvious facts once you listen to him speak. Damu the Fudgmunk, known also as just Damu, or Fudgemunk, made his initial mark on hiphop as the DJ for Panacea who broke in 2006. The Washington D.C. native plays the role of DJ/Producer in Y Society. Having a lot to express but little to say, he speaks through his MPC2000’s manipulation of his vast record collection. The science of digging, the studying, and the sheer appreciation for this music are no more evident than in Damu’s beats. 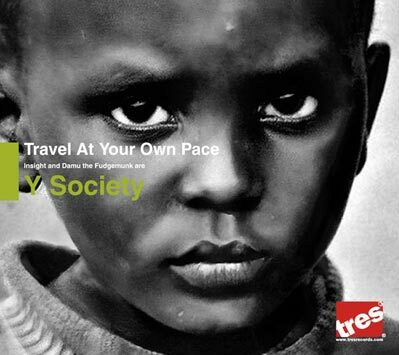 Fall 2007 will see the release of Y Society’s debut LP, Travel At Your Own Pace. The only question is: Are you ready?